Theresa May’s aides are believed to be planning to make parliament’s approval of her Brexit deal conditional on Brussels providing further concessions, specifically on the thorny issue of the Irish backstop, the Telegraph reported. The vote, penciled in for January 15 or 16, was pulled at the last minute in December when it became clear more than 100 Conservative Party lawmakers were going to opposite it. The Democratic Unionist Party, which props up May’s government, was always going to vote against her plan because it’s concerned the backstop arrangement would put Northern Ireland on a different regulatory footing to the British mainland. On the eve of MPs returning to Parliament, May wrote a column for the Mail on Sunday in which she sought to sway her rebel lawmakers -- mainly by playing the jobs card. MPs should consider the effect on “the jobs our constituents rely on to put food on the table for their families,” she wrote. She also, again, ruled out any possibility of taking the issue back to the electorate. “The only way to both honour the result of the referendum and protect jobs and security is by backing the deal that is on the table,” she wrote. Meanwhile, one group of cross-party lawmakers is working on a plan to derail any prospect of a no-deal Brexit, which appears to be the most likely option if May’s gambit fails. Led by former Labour minister Yvette Cooper, the group has tabled two amendments to the Finance Bill that would paralyze the government unless May wins her vote, the Times reported. 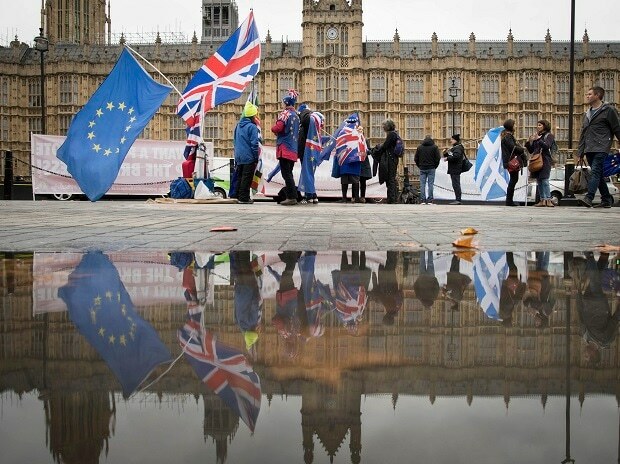 The bill, which goes to a vote Tuesday, gives the Treasury the right to spend money on a no-deal Brexit -- the amendments would block such powers unless Parliament explicitly wants a no-deal or the government asks the March 29 deadline be extended, the paper reported Cooper as saying.